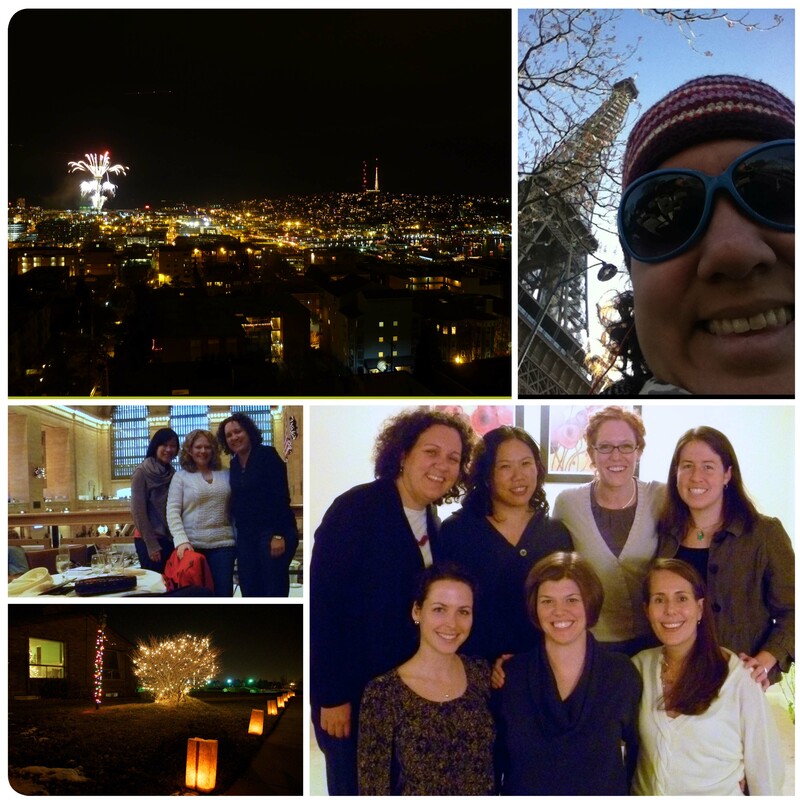 2013 is the first time since the year before I left for the Peace Corps (2004) that I did not spend the holidays with my immediate family. It made more sense for me to go home for Thanksgiving this year instead, which freed me up for traveling in the region of Christmas. My friends Brian, David and I started making plans to travel together way back in August. When we started talking about beach locations I suggested Madagascar as it’s one of the final countries in the region I haven’t been to and we had mutual friends who went in 2012 and raved about their trip. Once it was decided where we would go we added Kameko – a friend and former CHAI Lesotho colleague – to make an even group of four. 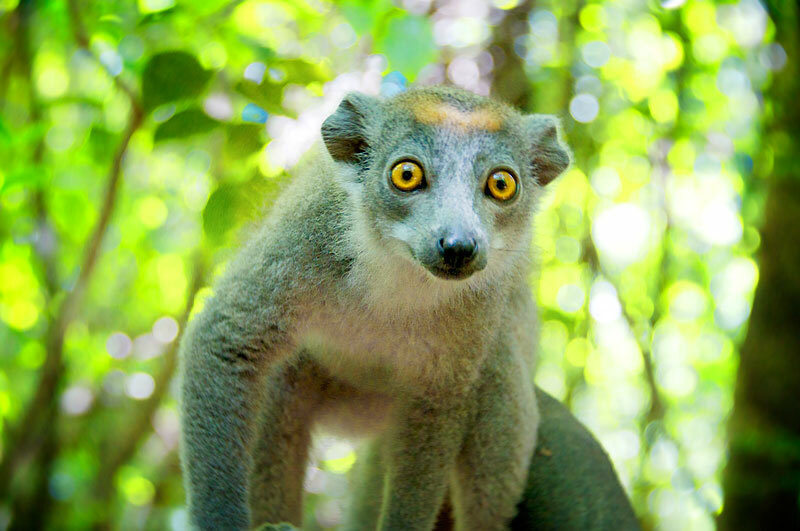 In three words: friends, lemurs and beach. Christmas, of course, did not feel like Christmas. We spent the morning hiking through Parc National Montagne D’Ambre in search of lemurs and the world’s second smallest chameleon and the evening playing Uno and drinking Duty Free vodka tonics. New Years Even we spent at our lodge on an island (Sakatia), off an island (Nosy Be), off an island (Madagascar) eating delicious seafood – possibly the largest lobster I’ve ever seen – and saving the night by stepping up as honorary DJ. The Black Eyed Peas and KC & the Sunshine Band were big hits. 🙂 In between was more hiking, geographical wonders, snorkeling and relaxing. For more photos check out my Facebook album where I posted 60+ of the 450+ photos I took and stay tuned for plenty of scrapbook pages attempting to document the trip! 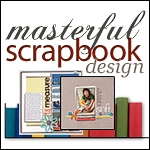 My blog posts have been decidedly scrapbooking heavy recently. 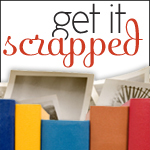 Taking the guided study critique class definitely had my attention drawn to scrapbooking and it was fun for me to share the changes to help me process what I was learning. I’ve created 27 layouts since January – compared to 89 for all of 2012. I’m definitely on a roll. The class is over and while it’s nice to have a small break I’m hoping it will reconvene soon! 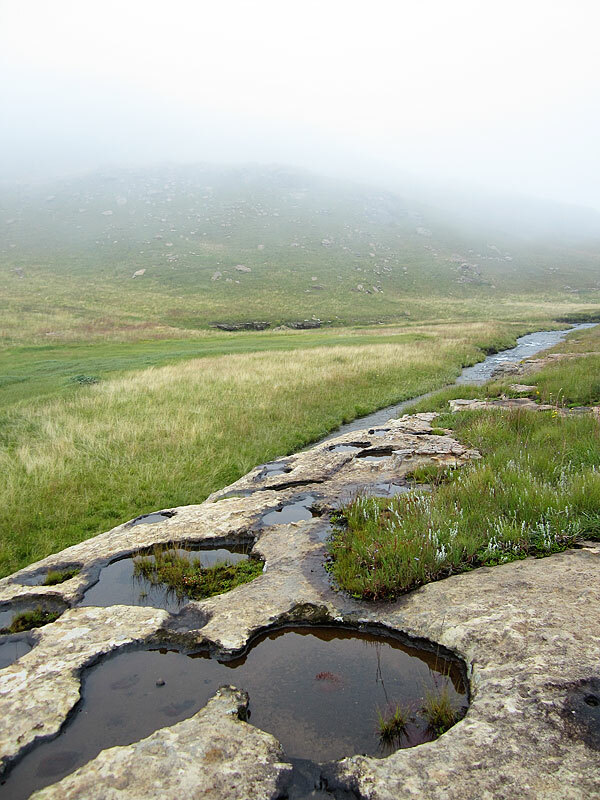 Sehlabathebe is remote even by Lesotho standards and in a country that isn’t exactly a hot spot for tourism making the park a place that very few people in the world are ever going to see. There are no villages near the waterfall or the lodge. 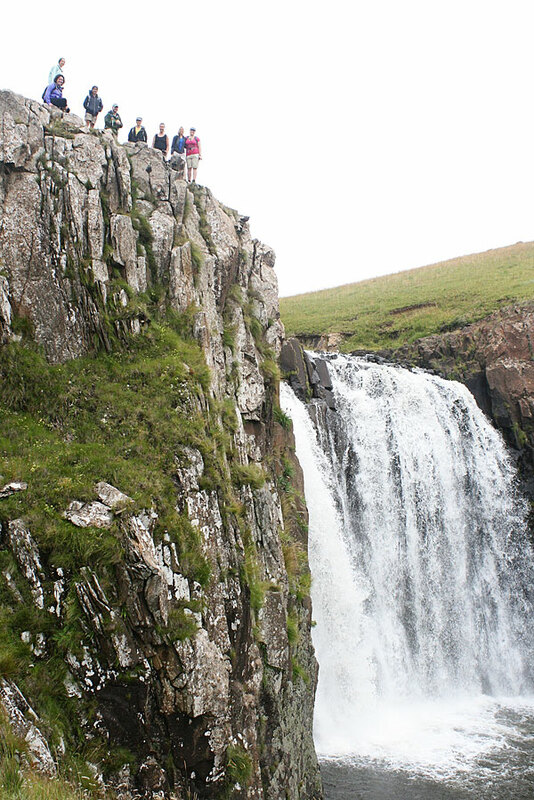 I wonder if people who live in the nearest village even know that the waterfall is there? How did they find it in the first place? 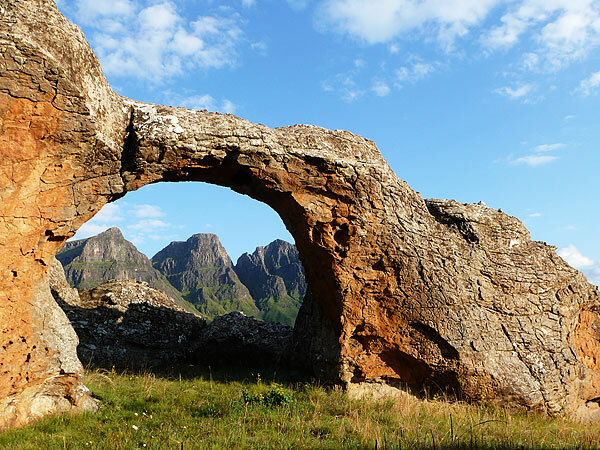 It was Lesotho’s first national park – established in the late 1960s – so obviously someone had the foresight to protect the land. I’m really glad that I made the trip again out there to get the views that we had this time. I think it is one of the most beautiful places I’ve ever been. The Maseru Crew – Katie, Bhavya and me – at the beginning of Day 1. Which route did you choose and why? 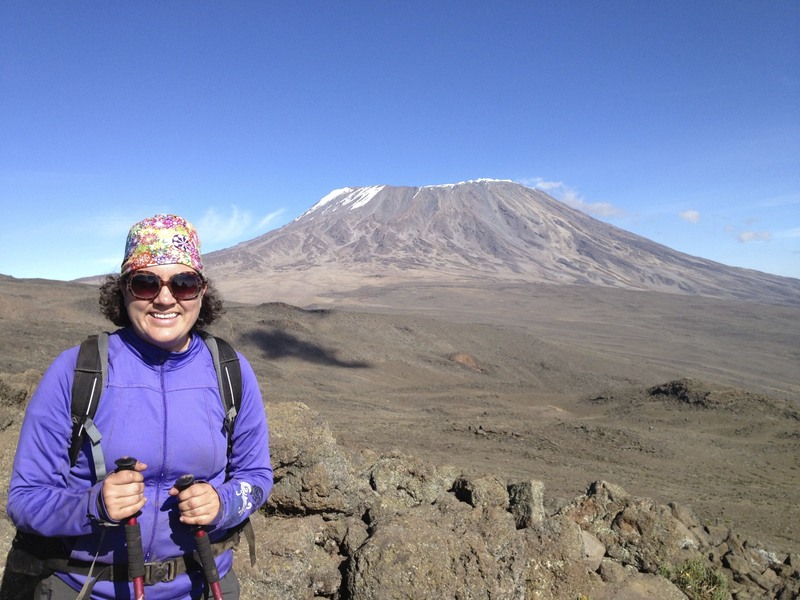 We narrowed our choices down to Machame and Rongai and ultimately went with Rongai because Andrew had previously summited using Lemosho, which shares a significant amount of trail with Machame. 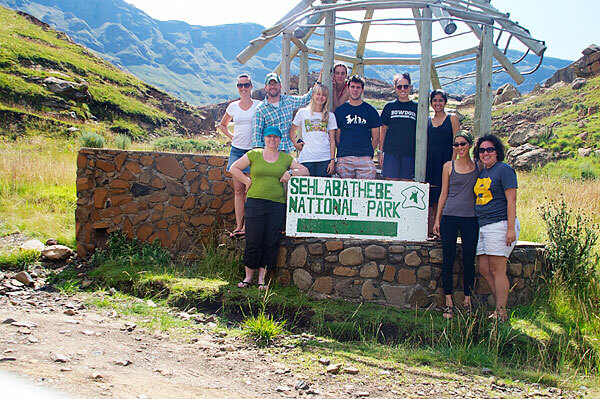 From base camp (Kibo Hut) there were only 3 or 4 other groups who summited with us – so maybe 20 people max. On the other hand, the summit route used by Machame/Lemosho et al had probably almost 100 people so I was really happy with our choice. Rongai descends using Marangu (aka the Coca Cola route) and I thought the views we had on Rongai were better. Did you use Diamox and did it work? 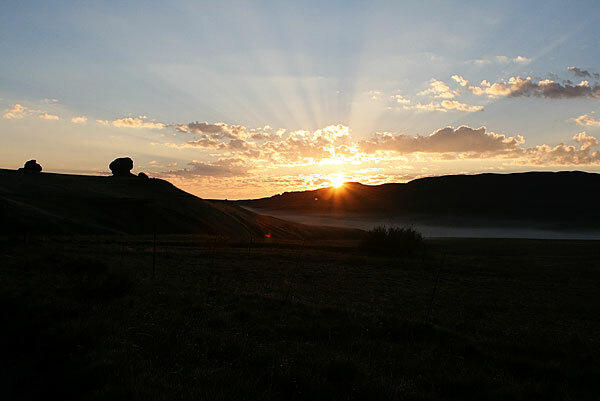 Diamox is a medicine that is used to prevent high altitude sickness. I don’t understand why it works, but it is pretty commonly recommended. I was on the fence about using it until 2 days before the climb when I met someone who said that her use of diamox during a high altitude climb was the difference between everyone else in her group hating life and her singing show tunes to keep their spirits up. Our lead guide, August, also recommended using it. 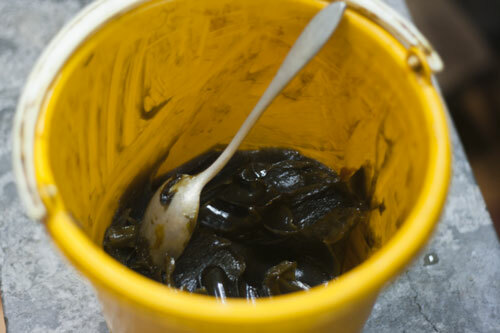 There were a couple of people in our group who had to stop using it because of bad side effects (mainly gastrointestinal). Obviously I have no idea whether it made a difference for me or not, but I like to think that it did. My best advice is to do what your guide tells you . View of Kilimanjaro on Day 4. What do you wish you had known before? I wish I had known how awesome hiking poles are because I should have been using them in my everyday life for hiking. Holy cow they give you so much more stability! I read that using them takes a significant amount of pressure off your joints on the descent, and was planning to use them specifically for that but they were also really great for the regular hiking as well. After my experience on Kili I will definitely be investing in a pair. I wish I had known that our guide company would issue us all standard duffle bags to put our things in. You could literally show up with a rolling suitcase and be fine. Instead I had packed my large backpacking backpack and large duffle bag to give them options of what to carry and we used neither of those. Pack baby wipes for cleaning up as there are no showers on the trails. Thankfully others in my group had packed plenty, but you may not be so lucky! Pack 2-3 energy bars per day. I was fortunate that I brought a bunch back from the US with me, but others were definitely missing them on summit night especially. My favorite was Luna’s Peanut Honey Pretzel, yum. Don’t forget that you’re going to need clean clothes for after the hike. That was definitely an after thought for me, but since I was visiting friends before the climb I had extra clothes. Others were relegated to wearing the same clothes for the two days before we traveled home. This week is the one-year anniversary of the beginning of my Morocco trip with my sister Allison. I realized that I never shared much about my trip on the blog because I wasn’t in a pattern of writing here at the time. Better late than never, right? In general Fes was my most favorite city. It’s where we had the best food, stayed in the best hotel/dar and had the best experiences. Casablanca was my least favorite city. 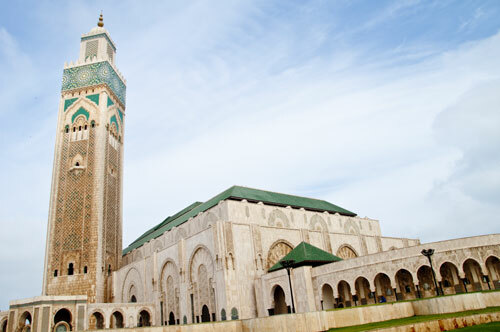 The only thing worth seeing there is the Hassan II Mosque, then you should book it right back to Rabat. 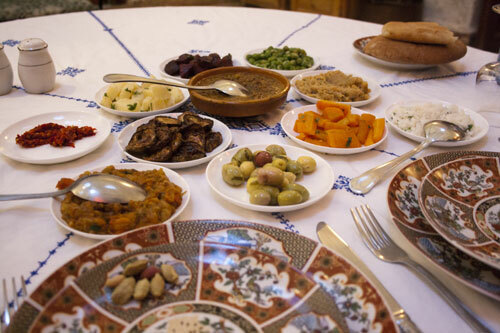 Restaurant Dar Hatim in Fes was the best food we had on the trip, plus it was an amazing experience. The restaurant is inside the proprietor’s (Fouad) home and after they make amazing homemade food they show you around the house and the kitchen. Plus they picked us up at our hotel and took us back at the end of the evening. Also in Fes Allison and I tried out a very traditional hammam. It was sooo cool. We were nervous beforehand, and did a bunch of research online about what to expect. My best advice? Just do it. The place was recommended by the owner of where we were staying as the place where his wife goes. We also loved the little pizza place that was directly across the street from where we stayed in Fes. We spent several evenings on their rooftop, eating margarita pizza and reading while we waited for the sunset and evening call the prayer. In Rabat we got to have lunch with my Country Director from Peace Corps. What a small world, right? 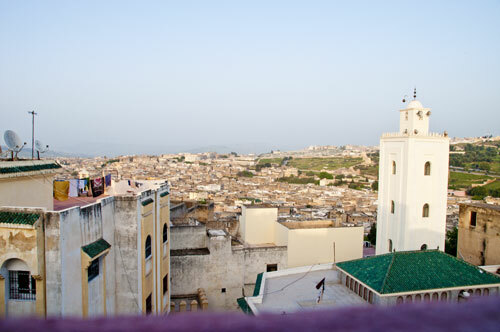 Fes was far less touristy than Marrakech, although Marrakech itself was not as hectic was it had been described. By the end of our trip we were sick and tired of negotiating prices for everything. It made me grateful that I live somewhere I can just shop at a grocery store and everything has a set price. We had delicious street food in Marrakech. 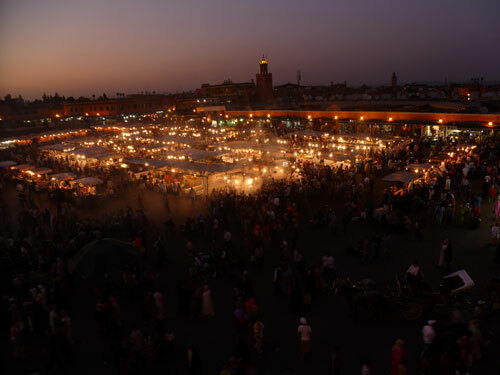 I loved how when the sun went down the whole square lit up with stalls selling food. 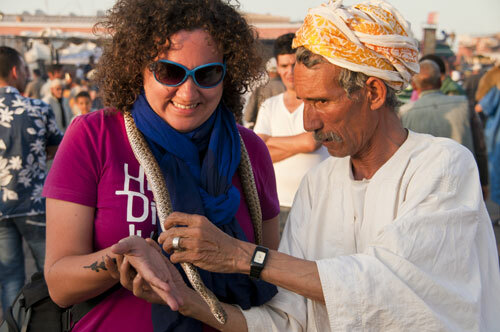 I did try out “snake charming” in Marrakech, totally worth the price for priceless pictures. Amount of snow falling from the sky: 0. This was the driest December in Utah on record. Hours spent watching Teen Mom 2: I didn’t count, but enough to know that I should never be allowed to have cable TV. Miles I Drove a Car: less than 1. I’ve realized that driving on the right side of the road just isn’t natural for me anymore. Every time I was in a moving vehicle and it made a turn I had to think twice about it. 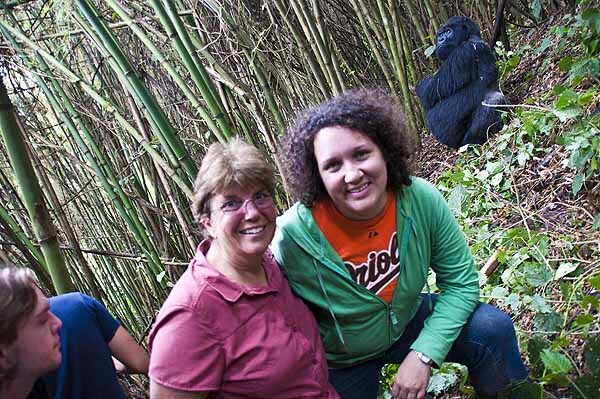 At the end of August I met up with my friend Wendy – who recently finished a Peace Corps Response project in Malawi – to see the gorillas in Rwanda. When Wendy came back to Africa at the end of last year she said that one of the things she wanted to do was see the gorillas. 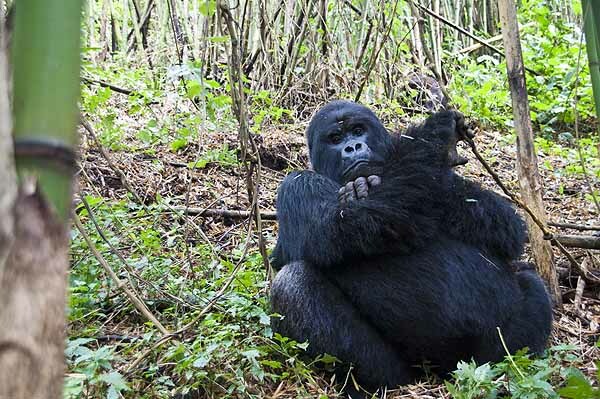 I said, “sign me up!” Going gorilla tracking is one of those things that can languish on your “to do” list. It’s not cheap. So having a friend who was committed to making it happen was just what I needed. 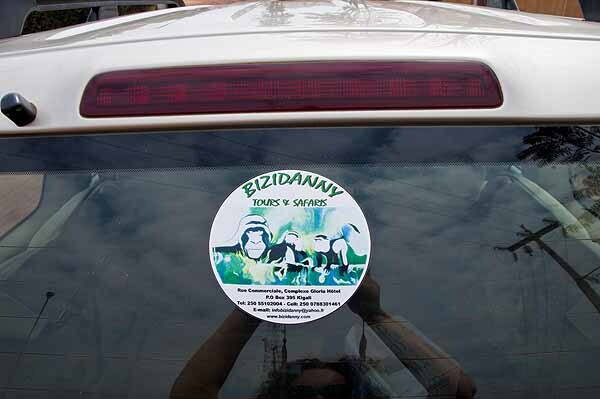 We booked our tour through Bizidanny – recommended to me by a former colleague. I would also recommend them. They were very responsive to emails and everything was well organized. Ask for Sam as your guide. We had him for our city tour of Kigali and absolutely loved him. Learned more in that 1/2 day with him than we did the rest of our trip. We stayed at the Mountain Gorilla View Lodge in Ruhengeri – just a 5 minute drive from park headquarters. Every afternoon at 4:30 the local school kids do traditional dancing for the guests. It was pretty cheesy. They smiled kind of creepily at us and kept saying “Welcome to Rwanda!” over and over again. Then there was the stern school teacher glaring over them as they performed. Maybe I’ve lived in Africa for too long; the other guests probably liked it. Sunday was our day for tracking. We purchased our permits in February because July/August are supposed to be the high season. We met a woman who was able to get 2 permits just a few weeks before, but I wouldn’t risk it. Plus it costs the same whether you buy early or buy late. 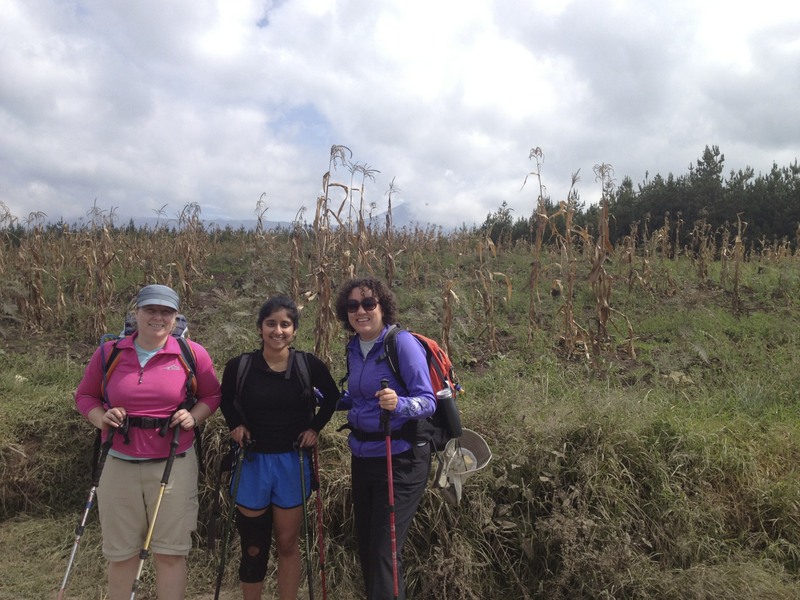 We were picked up by our guide from Bizidanny – Tarza – and taken to the Parc National des Volcans headquarters. We milled around the grounds while he joined the other guides to negotiate a place for us in a group. There are only 64 permits sold each day – so 8 groups of 8 people. We told Tarza to get us in a group with an easy or medium hike. While we were waiting I randomly ran into Gilbert who was the Administrative Officer for Peace Corps in Botswana and is currently the Country Director in Namibia. It was SO random. I love those small world moments. The group we were placed in had a family of 3 from Boston plus 3 younger guys from Europe. From the park headquarters we had to drive 20-30 minutes to the trail head. From there we hiked for about 1.5 hours into the forest to find the gorillas. 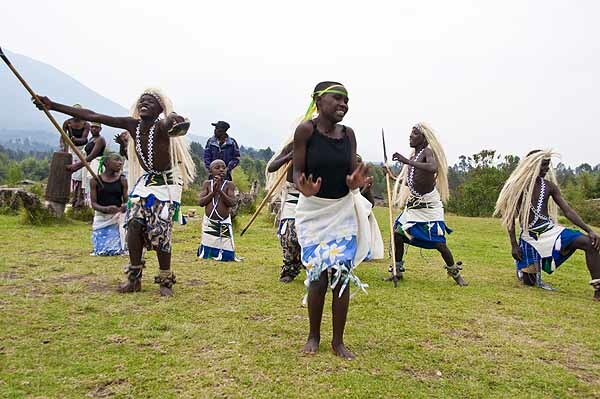 Before I went to Rwanda many people asked me questions along the lines of “Are you guaranteed to see the gorillas?” and I always told people that they are wild animals – so, no – but that I hadn’t heard any stories of people going and not seeing them. I know enough people – either directly or indirectly – who have been so I figured if that was a possibility I would probably have heard about it. Now I know why that doesn’t happen. 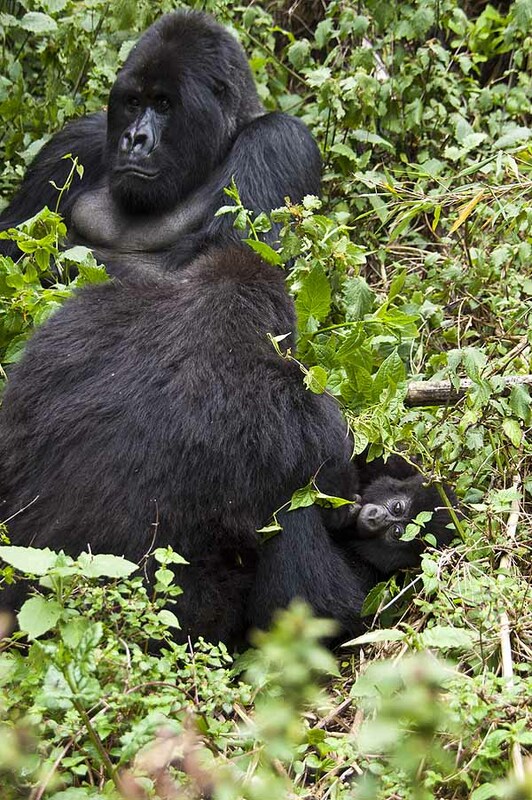 There are two men with big guns – called trackers – who stay with each of the gorilla groups 24 hrs/7 days a week. They protect them from poachers, watch their health and let the guides from the park know the groups location on a day-to-day basis. 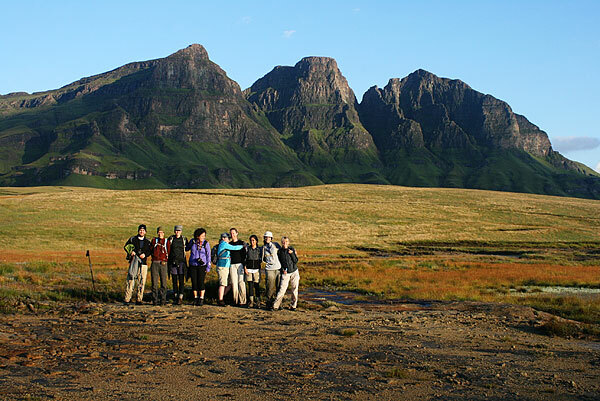 Speaking of guide, we were really lucky and got someone who is one of the more famous guides – Francois. 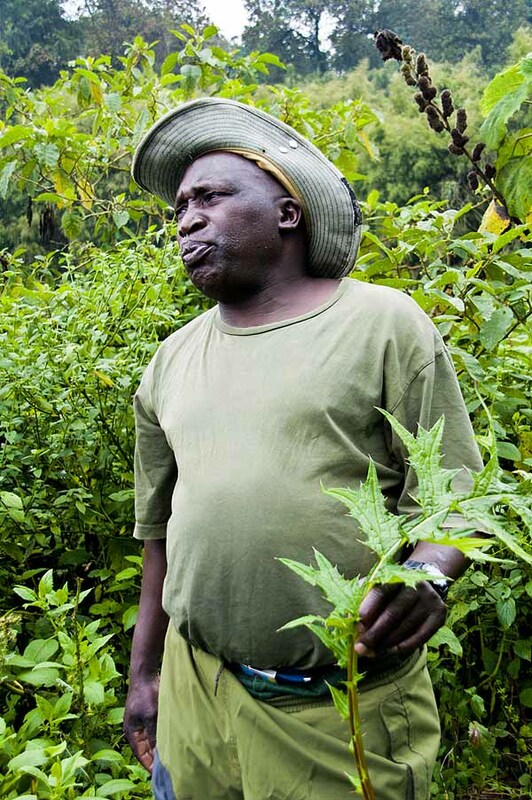 He’s worked as a guide for 29 years and even worked with Dian Fossey. He was fantastic. 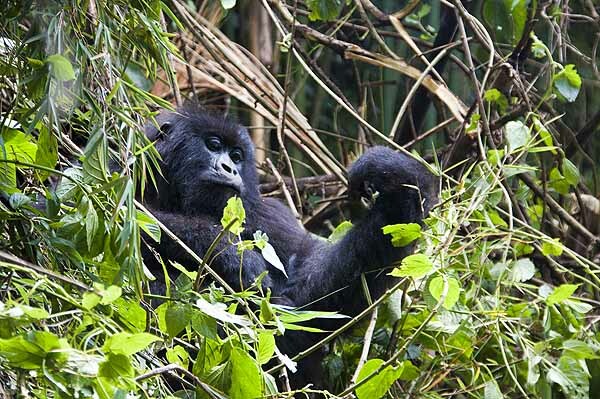 Along the hike he stopped several times to show us the various plants that gorillas eat – often eating them himself! He was also great at making sure that everyone was staying with the group. When we first approached the gorillas they were all up in the trees. You could see fuzzy black hair through little, tiny holes in the leaves. My first thought was, great, this is not what I was expecting. My second thought was, “I hope those bamboo trees can hold hundreds of pounds of gorilla!” It was a little unnerving for them to be climbing directly overhead. In terms of my expectations, I thought that we’d come across the group sitting in a clearing where we’d sit 20 feet away and watch them eat and play for an hour. Our experience was much cooler than that. There isn’t one moment that stands out from the hour we spent with the gorillas. Nobody did anything spectacular. No fights. No chest thumping. Just gorillas doing there thing with 8 people snapping pictures. It was darn cool. More to come in another post on the other places we visited during our trip. I had a bunch of video (thanks to Wendy) of our encounter with the gorillas of Sabyinyo group so I pieced together some of the best shots into a little 3 minute video. Enjoy! More details on the trip to come.